Hi loves! Checked out the blogsale yet? If not I recommend you do! If you read this blog on a regular basis you know how much I love the color teal. I love it dark, I love it light, plain ro with shimmer, if it's teal I love it. When I went to the Etos (a Dutch drugstore) and spotted this pretty it wasn't an exception to it. A medium dark teal creme base with gorgeous lighter shimmer running through. I was prepared for the shimmer to be way less pretty once on the nail but it wasn't! I needed 2 pretty easy coats. The only thing you want to be careful with is staining. I had a weak spot on my nail and it stained through the base coat. If you do wear a good base coat you'll be fine though. Do you like this one? And which teal do you recommend? This is beautiful! I always go weak in the knees for a good, shimmery teal =) I don't think I could even name a favorite teal, I love them all! Oooh, pretty! Gotta love that the shimmer is obvious on the nail too! I'm a super-huge fan of teals, and this one is gorgeous! *Love* that shimmer. 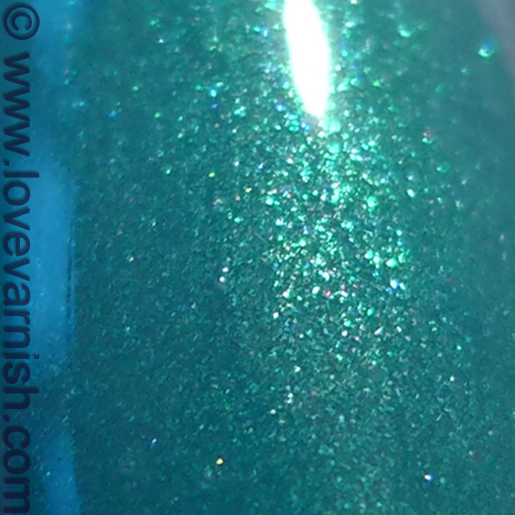 I actually have a pretty one from Skin Food up right now on my blog, and I'm looking forward to playing with the Zoya Zuza I bought a little while ago too. Ah yes, that essie is really something I want too! Thanks for the compliment! Yes, shimmer that remains visible kinda rocks haha! Yes you should ;)! And thanks hun! Thank you Elizabeth! Yes, Zoya Zuza is a gorgeous one too :). I'm really fond of teals...this one is really intriguing! !